Kerrie Power, chief executive of HEAnet, and Professor Anne Scott, recently appointed chairperson of the HEAnet board of directors, are two strong female voices leading for change across the higher-education sector. HEAnet is Ireland’s national education and research network, established in 1983 by the Irish universities with the support of the Higher Education Authority. Today, the network provides internet connectivity and IT services for all Irish universities, institutes of technology and other higher education institutions (HEIs), along with research organisations and all primary and post-primary schools across Ireland. That’s over 1 million students, staff and researchers relying on the HEAnet network each day. In June 2017, HEAnet appointed Kerrie Power as its new chief executive. Kerrie brings with her over 15 years of experience of leadership in the field of tech, including roles at Nordeus Games, YouPass Technologies and other international companies. While education has modernised a great deal in recent years (how many readers had interactive whiteboards in their classroom when they were in school? ), there is always room for improvement. HEAnet is also proactive in getting girls interested in STEM (science, technology, engineering and maths) subjects through their involvement with Teen Turn, a project which works to change how girls identify with careers in technology, under the tagline ‘Turning Teens Toward Tech’. With Teen Turn, girls receive summer work placements with prominent technology companies, helping to inspire and engage them, and to defeat stereotypes around tech as a typically ‘male’ industry. Broader cultural shifts have played a role as well. Not long ago, getting into computers was often depicted as a niche activity for (typically male) geeks. Today, by contrast, technology is ubiquitous; it follows that the next generation of students will want to understand in detail how it works. In July of this year, HEAnet announced another new appointment: that of Professor Anne Scott, as chairperson of their board of directors. Professor Scott arrived with an extensive track record of promoting and addressing gender balance in education. 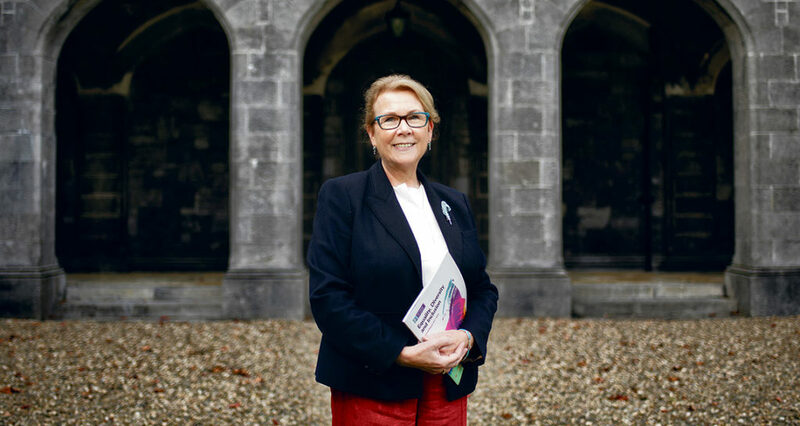 Currently the vice-president for equality and diversity at the National University of Ireland, Galway, she worked previously as executive dean of the Faculty of Education, Health and Community at Liverpool John Moores University, and at Dublin City University, initially as a professor and head of school and then as deputy president and registrar, for a total of 14 years. Early on in her career, Professor Scott relied on hard work and her innate self-assuredness to overcome any prejudice against women in academia. Drawing on her own experiences, as well as interviews with the staff at NUI Galway, Professor Scott identified the issues preventing women from putting themselves forward for positions of leadership. “There are a number of things we know, for example that women are less likely to put themselves forward even for promotion, let alone for significant leadership roles, and tend to be extremely self-critical about their experience, their skill set and/or their ability to do the job. But they will also tend to respond better if they are encouraged to go forward . . . This is why issues like visibility of role models, mentorship and encouragement are so important: years of imbalance have led women to doubt themselves, to avoid risk and to keep a low profile. Upon her arrival at NUI Galway, Professor Scott was faced with the complicated task of unravelling some deep-rooted, if unconscious, institutional biases, which had led to a number of gender-discrimination cases being taken against the university. Professor Scott acted on 24 recommendations made by NUI Galway’s Gender Equality Task Force (chaired by Professor Jane Grimson, TCD), compiling a fully developed action plan within a couple of months of her arrival. She met with roughly 70 people from around the university, including the president, the deans, heads of units, heads of department and senior academics, to ask what they thought of the report and what areas they were most concerned about improving on. Once the interviews were done, Professor Scott created a list of priorities and ways to achieve these goals. “Right now, 21 of the 24 recommendations are either fully implemented or on target in terms of implementation, although there’s a couple, particularly around professional services, that we’re still working through,” said Professor Scott. Among the most visible changes is an increase in the number of female senior lecturers; currently, 43 per cent of those employed are women. It’s a dramatic turnaround for NUI Galway, from one of the lowest rates nationwide to one of the highest. Women are under-represented in senior roles at third-level institutions in Ireland; while approximately 45 per cent of academic staff in this country are female, over 75% of the professoriate are men. This is where the mission of Professor Anne Scott and that of HEAnet align, because in Ireland women are similarly under-represented in tech. In Ireland right now, studies indicate that only roughly a quarter of the people working in STEM careers are women. Just under 1 per cent of the venture capital funding in Ireland goes to start-ups with female founders, and on average, women working in the IT sector in Ireland earn 17 per cent less than their male counterparts and make up only 19 per cent of the IT workforce. In both academia and in tech, to commit to redressing the balance is a significant challenge, and a brave statement of intent. “With STEM it’s a difficult issue,” said Professor Scott, “because the problem starts at the very beginning of the pipeline. We need to start our interventions much earlier.” Warning of technology’s ability to perpetuate biases and inequalities, even as it attempts to overcome them, she noted the problems with apparently ‘neutral’ technology: “One of the big things people are now actively pointing out is the profound influence that artificial intelligence is going to have on our futures. Some of that is going to be very pragmatic and useful, but the people who are building those programmes and doing the coding are almost all men, and therefore you’re getting very stereotypical ideas being perpetuated. Figures from the State Examinations Commission indicate an 11 per cent rise in the number of girls studying higher-level physics and a 9 per cent rise in those studying chemistry. Meanwhile at Junior Cert level, the number of girls sitting higher-level STEM subject exams is steadily rising too. While at present only one in four working in the Irish tech sector is female, the hope is that this figure will rise in coming years as the tech industry becomes a more inclusive place. This change begins in connected classrooms: for HEAnet, connectivity is a catalyst, one capable of opening up the world for students, and transforming education for the better. Kerrie Power and Professor Anne Scott are both plenary speakers at HEAnet’s National Conference taking place on Wednesday 7 – Friday 9 November at the Galmont Hotel, Galway (formerly known as Radisson Blu).